You might look at this and baulk, thinking 'that's not the 1966 Batmobile though! 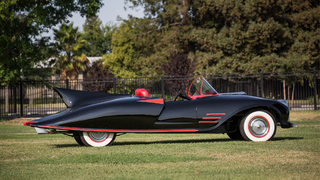 ', but this is the very first officially licensed Batmobile, having preceded Adam West's TV ride by 3 years - and it just sold for a pretty penny at auction. This Batmobile was first built in 1963 by Forrest Robinson, an adaptation of the Batmobile from the comics at the time, and a completely custom vehicle (unlike the 1966 Batmobile, a repainted Lincoln Futura) - Robinson originally built the vehicle just for himself, but eventually it caught the attention of DC Comics licensee, who paid Robinson to tour the vehicle around the US promoting Batman comics, making it the first ever real-world Batmobile, 3 years before the 1966 TV adaptation would deliver its own iconic vehicle. As the TV show's popularity skyrocketed and set off a wave of Batmania, the original Batmobile was returned to Robinson as versions of the TV Batmobile started touring the country, and he eventually sold it. It eventually resurfaced in a pretty beat up state in 2008, before it was purchased and restored in Sacramento, California last year - before coming to where it is now, having sold at auction for a whopping $137,000. Not bad for the Batmobile that time forgot, huh? You can check out more pictures of the Batmobile in action over at Heritage Auction's Website.